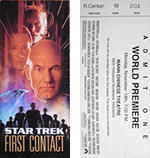 Opened in Limited Engagements on Friday, December 29, 1995 on 3 Screens. Reported Average Gross "12 Monkeys"
Reported Average Gross "Broken Arrow"
Reported Average Gross "Rumble in the Bronx"
Reported Average Gross "Executive Decision"
Reported Average Gross "Primal Fear"
Reported Average Gross "The Substitute"
"See it as it was intended to be seen on the giant 60 foot screen"
Photo by Richard Soberka, via Photoway.com. Reported Average Gross "Mission: Impossible"
"The Event Movie of the Summer on the Giant 60 Foot Screen"
Reported Average Gross "Independence Day"
"See it on the Giant 60 Foot Screen"
Reported Average Gross "Escape from L.A."
Reported Average Gross "The Island of Dr. Moreau"
Reported Average Gross "Maximum Risk"
Reported Average Gross "Last Man Standing"
Reported Average Gross "The Glimmer Man"
Reported Average Gross "The Associate"
Reported Average Gross "Space Jam"
Reported Average Gross "Star Trek: First Contact"